The Rensselaer County Historical Society (RCHS) announces their September and October Hidden History programs. Which will focus on the Knickerbocker Mansion, Schaghticoke, NY (on Tuesday, Sept 5) and Crailo, the Museum of the Colonial Dutch, in Rensselaer, NY (Tuesday, October 30). The Rensselaer County Historical Society and Museum is a dynamic not-for-profit educational organization established in 1927 to connect local history and heritage with contemporary life. We strive to enrich the present and advocate for the future by bringing the region’s past to life, recognizing every face and every story. RCHS is located at 57 Second Street, in Troy. The Knickerbocker Mansion located in Schaghticoke was built by Johannes Knickerbaacker III around 1780. The house was lived in by generations of the Knickerbocker family but fell into disrepair in the 20th century. A dedicated group of volunteers began restoration and after decades of work the building has been almost completely restored. Join Rensselaer County Historian, Kathryn Sheehan, on this special tour of one of Rensselaer County’s oldest buildings. Rensselaer County Historian, Kathryn Sheehan, will lead our visit to Crailo, a State Historic, which tells the story of the early Dutch inhabitants of the upper Hudson Valley through exhibits highlighting archeological finds from the Albany Fort Orange excavation and guided tours of the museum. Originally part of the vast landholding called the Manor or Patroonship of Rensselaerswyck, the Crailo farm was named after the Van Rensselaer’s estate in the Netherlands, variously spelled Crayloo or Cralo in the 17th century, and meaning &#8220crows’ wood&#8221 in Dutch. Tour includes viewing the award winning short-film, Keeping Order: A Fort Orange Court Record. The Rensselaer County Historical Society (RCHS) offers walking tours of historic downtown Troy on Saturday mornings this September and October. Tours depart from and return to the Market Table at the Troy Farmer’s Market at 10:30 am. Each week brings a different theme for the tours, which are led by RCHS staff and frequently incorporate historic photographs and readings from letters and diaries. Discover this historic Hudson River crossing point and the various bridges that have been built at this site. This tour takes you to sites associated with Samuel Wilson, the &#8220real&#8221 Uncle Sam. You’ll also visit the RCHS museum, which includes artifacts from Samuel Wilson’s life and images of our national symbol. Stroll the streets of downtown Troy and find a rich built environment. Tour showcases Troy’s architectural gems as you explore the range of styles found in Troy. For much of 1824 & 1825, Lafayette, the hero of the American Revolution, made a triumphal visit to the US, including visiting Troy twice. Follow in his footsteps as he was shown the bustling city that Troy had become. Troy was a hotbed of abolitionism. Walk to where history was made including the site of the rescue of Charles Nalle. Stroll downtown Troy and you’ll find a rich built environment. This tour showcases Troy’s architectural gems and range of styles. Join us as we look at the many monuments that remind us of wartime sacrifice, famous events and the people who left their mark on Troy. RCHS is located at 57 Second Street, Troy NY 12180. 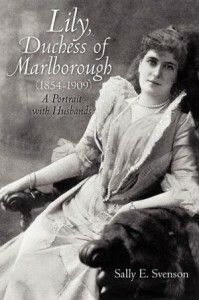 When Sally Svenson, an summer resident of Lake Luzerne and occasional contributor to Adirondack Life magazine, was writing Adirondack Churches: A History of Design and Building (2006, North Country Books) , she stumbled upon the life of Eliza Warren Price, known as Lily, Duchess of Marlborough. 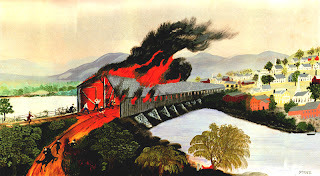 On May 10, 1862, as the nation was consumed by the ravages of the Civil War, Troy NY faced a devastating fire. As a train crossed the Hudson River on the Troy-Green Island Bridge, a spark from the engine ignited the wooden bridge. The fire spread rapidly, ultimately destroying over 600 buildings in the heart of the city in only six hours. Newspaper accounts, personal letters and even artist renderings depict a city in chaos as people struggled to save their homes and businesses. The Rensselaer County Historical Society (RCHS) has opened a new exhibit commemorating the 150th anniversary of Troy’s Great Fire. The exhibit runs through August 18, 2012. Advances in fire fighting technology, such as the use of steam-powered fire engines were applauded for their role in saving the city, and citizens joined together to re-emerge from the catastrophe. Well known architects designed new buildings in the latest styles and new building codes were introduced mandating the use of fire resistant building materials. The exhibit focuses on four main themes- Troy in the 1860s, Mid-19th Century fire fighting techniques, the event itself known as The Great Fire of May 10, 1862 and the aftermath, including personal impacts, changes to city code and fire safety. A number of early photographic images, several recently discovered, show the city just before the fire and document the devastation. Artifacts on display include firefighting equipment such as fire buckets, a rare fireman’s jacket and helmets. Accounts of the event from local newspapers and eyewitness descriptions found in personal letters, several of which came to light as research was undertaken, tell the story firsthand. A number of fire related artifacts from public institutions and private lenders will also be on display for the first time, including a toy steam fire engine from the FASNY Museum of Firefighting in Hudson, New York. Programming during the exhibit will include a trip to see the extensive fire collections at the FASNY Museum of Firefighting. RCHS will lead a walking tour of the district impacted by the fire on Saturday, May 12 at 10:30am. The tour departs from the Market Table at the Troy Waterfront Farmers’ Market. Tour is $5 per person, free for RCHS members. Stacy Pomeroy Draper, RCHS curator, is available to give illustrated lectures about the fire. The exhibit is sponsored in part by B-Lann Equipment Co., John G Waite Associates and the Troy Uniformed Firefighters Association. The 11th Anniversary Conference on the Underground Railroad Movement, sponsored by the Underground Railroad History Project of the Capital Region Conference, will be held at Russell Sage College in Troy, April 13-15th. This year’s conference, &#8220The Underground Railroad Turned On Its Head – Old Themes, New Directions,&#8221 focuses on new research on the Underground Railroad, slavery, abolition and the 19th century. Old assumptions such as “There is little documentation of the Underground Railroad”, “The UGRR was a string of safe houses to Canada” and numerous other ideas are challenged by new research and interpretations. A bus tour of UGR Sites in Rensselaer County by Kathryn Sheehan, Rensselaer County Historian. The Underground Railroad History Project of the Capital Region researches, preserves, and retells New York’s regional history of the Underground Railroad, highlighting the role of African-American freedom seekers and local abolitionists. Rensselaer County Historian Kathryn Sheehan will lead a tour of Mt. Ida Cemetery, which features some of the oldest headstones in the city of Troy, and the Poestenkill Gorge, a favorite destination for picnickers, photographers, and nature enthusiasts for centuries. The waters of the Poestenkill collect in Dyken Pond, then make a dash for the Hudson River below. The Mt. Ida falls drop roughly 85&#8242- into a gorge of crumbly black shale, make a right angle turn, dropping a further 75&#8242- into a massive pool. This source of water power fueled several industries along the Poestenkill’s banks in the 19th century. Hidden History – Mt. Ida Cemetery and the Poestenkill Gorge will be held on Tuesday, March 27, 2012 at 4:30 pm. The cost is $15 per person and $12 for RCHS members. 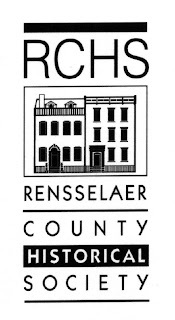 The Rensselaer County Historical Society and Museum (RCHS) is a not-for-profit educational organization established in 1927 to connect local history and heritage with contemporary life. RCHS is located at 57 Second Street, Troy NY 12180. 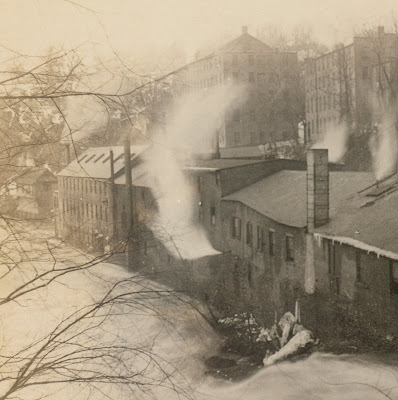 Photo: Mills along the lower Poestenkill Gorge at the foot of Cypress Street including the Griswold Wire Works, Tompkins Brothers machine works, and above Manning Paper, which occupied earlier Marshall textile mill buildings. Courtesy Troy Public Library. It’s a great show of force, but it’s not enough. After several unsuccessful encounters with the vessel, reinforcements are needed. Corporal Boyd Montgomery of the 34th Armored Regiment is dispatched, speeding across the countryside in an army tank. Power lines are downed by the aircraft, but Montgomery continues his pursuit. Two miles into the chase, he employs a bit of ingenuity to bring the craft down. It is soon nothing more than a flattened heap. That’s how it happened in July 1943. It’s all true, but with a few details omitted. The craft that was spotted actually was huge (75 feet long) and it did come from a foreign land (Kingston, Ontario, Canada). The damage was no less real?a dangling cable tore down power lines between Evans Mills and Philadelphia in Jefferson County. Lawmen from several agencies did pursue the craft, but three times it slipped from their grasp. The military installation was Pine Camp, later expanded and renamed Fort Drum. And it was an Army tank that provided the solution, driving atop the 1800-foot-long cable after a two-mile chase, forcing the vessel to the ground until nothing was left but a flattened balloon. The balloons caught on in a big way in England and were often used effectively. During one of the two major German onslaughts on London during the war, 278 Flying Bombs were intercepted by the balloons, surely saving many lives. In summer 1941, British officers warned America that Nazi planes could fly at 20,000 feet and reach the US mainland within 12 hours, with no defense system to greet them. Months before the United States entered WW II, the Navy established two Barrage Balloon squadrons with more than 150 balloons. Intended to protect American fleet bases from air attacks, the balloon strategy was very popular for another reason: cost. Building a large coastal hangar for planes involved an expenditure of $600,000- a more secure underground facility carried a price tag of $3 million- but each barrage balloon cost only $9,500. Many North Country men were assigned to Barrage Balloon outfits, and it was anything but a cushy job. 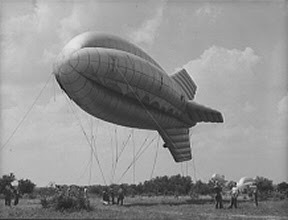 Since troops as well as installations needed protection, balloon men were often among the first ashore, as was the case in several beach landings in Italy and North Africa. 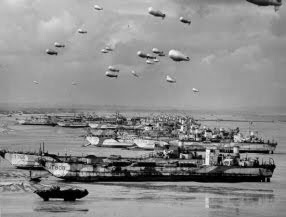 And on D-Day, Barrage Balloons dotted the sky above the invasion fleet. In March 1943, a hulking Barrage Balloon 65 feet long and 30 feet in diameter toured the Central Adirondacks, damaging power lines before snagging in a balsam tree a few miles south of Indian Lake, where a crew of men managed to deflate it. To raise public awareness of the war effort and relieve anxiety about the occasional balloon escapee, the military dispatched a road crew in an army jeep with a smaller, 35-foot balloon strapped to the roof. In summer 1944, they visited Troy, New York. The craft was inflated and floated at 300 feet for an entire day while the men fielded questions. It was the same model as those used to defend the city of London and the beaches of Normandy. 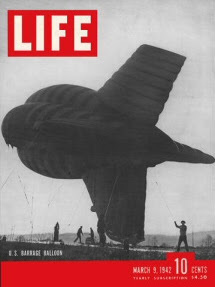 Photos?Top: Barrage Balloon on the cover of LIFE magazine. Middle Right: The training facility on Parris Island, South Carolina (1943). Middle Left: Barrage Balloons above the Normandy shore (1944). 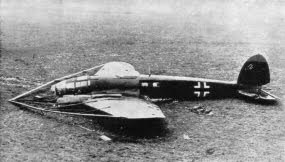 Bottom: German plane equipped with a cable-cutting device. The Rensselaer County Historical Society (RCHS) has announced new school-break week programming for 2012. Each day includes activities, projects, crafts and games. Children will also have time to tour the Hart-Cluett House and explore downtown Troy. The programs are for children in grades 3 – 6. The programs run from 9:00am – 4:00pm (early drop-off and late pick-up, and extended care are available for an additional fee). Each program includes materials, craft supplies and daily snacks (though not lunch). The cost for RCHS Members is $225- Non-Members, $275. Early-bird registration provides a 10% discount if you register before January 27, 2012 for February’s program and March 16, 2012 for April’s program. To register call 518-272-7232 x.12 or visit www.rchsonline.org for registration materials. Buildings, buildings, they are all around us but how many times have you really looked at a building? In this program, students will explore the many sides of buildings and participate in scavenger hunts in downtown Troy looking for Lions, Bells and Faces, design their own dream home, build a model city and more. Who were the people who made up the Underground Railroad and where did it take place? Students will take a walking tour to sites that are connected to the Underground Railroad, view an art exhibit, make their own pieces inspired by history, and perform a play about a dramatic rescue. Papers from the New Netherland Institute’s annual Rensselaerswijck Seminar has long served as a platform for local historians to present their latest research on the only successful patroonship in New Netherland. A Beautiful and Fruitful Place: Selected Rensselaerswijck Papers, vol. 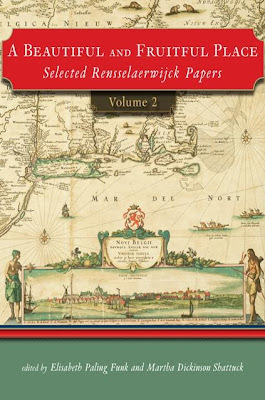 2 (SUNY Press, 2011) includes papers delivered at the seminar from 1988 to 1997 and features New Netherland’s distinctive regional history as well as the colony’s many relationships with Europe, the seventeenth-century Atlantic world, and New England, these cogent and informative papers are an indispensable source toward a better understanding of New Netherland life and legacy. Leading scholars from both sides of the Atlantic critique and offer research on a dynamic range of topics: the age of exploration, domestic life in New Netherland, the history and significance of the West India Company, the complex era of Jacob Leisler, the southern frontier lands of the colony, relations with New England, Hudson Valley foodways and Dutch beer production, the endurance of the Dutch legacy into nineteenth-century New York, and contemporary genealogical research on colonial Dutch ancestors. Edited by Elisabeth Paling Funk and Martha Dickinson Shattuck, the newest volume of papers includes chapters from Rensselaerswijck Seminars on domestic life in New Netherland, the Age of Leisler, New Netherland and the Frontier, The Persistence of the Dutch after 1664, The Dutch in the Age of Exploration, Manor Life and Culture in the Hudson Valley, Family History, Relations between New Netherland and New England, The West India Company and the Atlantic World, and more. What follows is a guest essay by Shirley Dunn, a historian of Rensselaerwijck and the Mohican. A surprise &#8220Dutch&#8221 house dating to about 1700 (or just before), located on Route 9J near the Teller Crossing, is for sale. The bricks have been covered with siding and the roof slope has been changed so you would not know it is that old. The original walls, cellar fireplace support, and beams in the cellar, as well as vlechtingen at roofline in the attic, remain in place. All bricks used to build the house were of the thin pre -1703 size. The house appears on mid-1700 maps and belonged to the farm called &#8220Cost Verlooren&#8221 leased by the Abraham Van Deusen family in the late 1600s and passed down through daughter Jannetje into the Witbeck family. 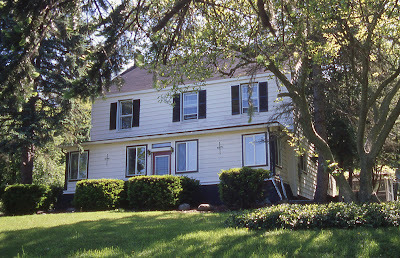 Although it is probably the oldest house in the East Greenbush area, excepting for Staats house, it was hidden by early 20th century siding and missed by the Historic American Buildings Survey of the 1930s. In the early 1900s or before, the slope of the roof of this old Dutch-style house on the river road below the present City of Rensselaer was raised so a second floor could be developed. The newly built second floor portion was covered with white siding on the outside and the bricks on the south gable and the first floor were painted white. This is apparently why the house was bypassed by the Historic American Buildings Survey in the 1930s. Since then, the brick house was completely covered with modern siding late in the 20th century, to preserve the brick. In the 17th century, the managers of Rensselaerswyck, which was a colony begun by Kiliaen Van Rensselaer, leased out farms along the river below the present City of Rensselaer. A valuable farm near the present-day Hayes Road intersection was leased to Teunis Dirckse Van Vechten. His son, Gerrit Teunis Van Vechten, sold the lease to Claes Van Petten. In 1696, the Claes Van Petten-Teunis Dirckse farm was obtained by speculators Samuel Staats, Barent Rynders, and Joachim Staats. In May, 1699, these men sold the farm lease back to Gerrit Teunis Van Vechten and Jonas Douw, the brother-in-law of Gerrit. North of the Van Vechten property, another farm had been established in 1639. In 1640 its combination barn-with-residence attached burned down. Later leased by Cornelis Van Nes, who had little success, the farm earned the nickname Kost Verloren, or “Money Thrown Away.” (For details, see Dunn, “Settlement Patterns in Rensselaerswijck,” de Halve Maen Magazine (Holland Society, Lxvii, Fall 1994). Despite this history, in 1687, a lease for this Kost Verloren farm was obtained by Melgert Abrahamse Van Deusen, a carpenter. Van Deusen had been working in the area as a farmer on rented land which was no longer available at Fort Crailo (Correspondence MVR 181-182). In the nineteenth century, part of the Kost Verloren farm was owned by the Teller family. On this latter site, immediately beside a railroad crossing still known as Teller’s Crossing, a gambrel-roofed brick house survived until the 1920s. It was known as the Teller Farmhouse. The gambrel-roofed houses of our area were generally built in the decades after the late 1750s, after the French War wound down. 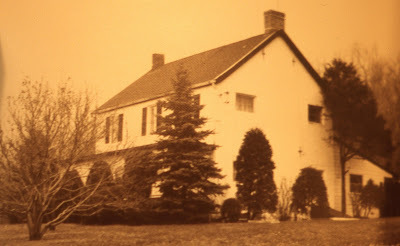 The farmhouse, of which a photograph exists, was probably built in the 1760s. This date is based on a map of the 1750s, which showed only one house in the area. (For photo, see Reynolds, Dutch Houses in the Hudson Valley before 1776 (1928) pages 84-85, photo 143). The gambrel-roofed Teller farmhouse therefore was not the earliest house on the Kost Verloren farm. Maps indicate it appeared between 1757 and 1767. An earlier existing house on this farm was mentioned in the renewed lease of 1709 given to Melgert Abrahamse Van Vechten. According to Reynolds, in Dutch Houses in the Hudson Valley, page 84, Melgert Abrahamse Van Deusen, (First Settlers p. 124) conveyed part of his farm to his daughter, Widow Jannetje Van Deusen Witbeck in 1733. As the stated north boundary line of the land of Johannes Van Vechten, a son of Gerrit Teunis Van Vechten, adjoined Jannetje Van Deusen’s land, we know that Jannetje’s portion was the south part of the Kost Verloren farm. She was his daughter, although not listed in Pearson’s First Settlers. Jannetje was the widow of Thomas Janse Witbeck who had been buried two years earlier on Papscanee Island in 1731. Jannetje Van Deusen had married Thomas Janse Witbeck at the house of her brother, Rutger Van Deusen, in 1702. Since Rutger Van Deusen was a son of Melgert Abrahamse Van Deusen, we know that Jannetje was his sister.. Rutger had married Wyntje Harmense in 1692 (Pearson, First Settlers of Albany Co.) Rutger is identified as a linen weaver. Can I speculate? Possibly Widow Jannetje agreed to take care of her father in his declining years, in exchange for title to the land she already lived on. Melgert Abrahamse Van Deusen was buried on Papscanee Island in 1742. A map of 1757 shows one house in the area of Kost Verloren. This house is most likely today’s surviving Hurley house obliquely opposite the former Teller Crossing and Teller Farmhouse (now gone). According to evidence remaining in the Hurley house attic and cellar, it was a one-and-a half story steep-roofed Van Rensselaer-style tenant house, possibly built at the time of Jannetje’s 1702 marriage. Alternately, this could be her father’s house from before 1700, or an unidentified early house on Kost Verloren. It is unlikely it is her brother, Rutger’s house, since he may have lived in Albany (1702 list). Jannetje Van Deusen Witbeck’s house and farm passed to an Abraham Witbeck, probably her son, who passed it to his daughter, Jannetje, married to James Cole. He is most likely the Abraham Witbeck who appears at number 45 on the 1767 Bleeker map of house sites. A Melgert Abramse Witbeck is listed on the 1767 map at number 44. He appears to be a son of Lucas Janse Witbeck who in 1692 married Catrina, another daughter of Melgert Abrahamse Van Deusen. (Pearson, First Settlers, page 153). By the time of the 1767 map, apparently his gambrel-roofed house known as the Teller farmhouse had been erected, probably number 44 on the map. The two houses were not far apart on Kost Verloren. According to Reynolds’ research, Jannetje Witbeck’s farm later belonged to Coles, Nortons and Tellers (Dutch Houses, page 84). However, her research related to the gambrel–roofed Teller Farmhouse of the 1760s, which she thought was an older house, possibly Jannetje’s. Thus, this ownership research might apply only until the two properties were separated. Deeds to the property could be checked at Troy. Earliest deeds might be at the Albany County Hall of Records. In the 20th century, the still standing older house on Kost Verloren belonged to the Hurley family beginning about 1950.
ricks lines the steps to the cellar (bricks about 7.5 inches long x 1 ? high by 3 ? to 4 across, in various shades of red). Hewn chamfered beams cross the cellar in the Dutch style from wall to wall. The present owner has supported the old beams with jack posts. The cellar holds proof the house had jambless fireplaces. 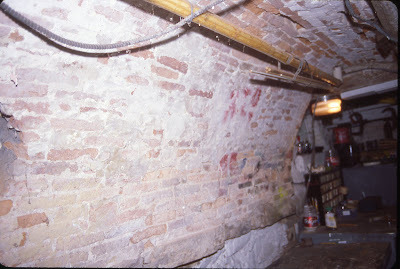 At the south end of the cellar is a well-preserved, 89 inch long brick arch which once had trimmers at each end. The arch is constructed of the same thin bricks noted above, the arch resting on a row of flat stones protruding a few inches from the cellar wall. The arch extends 33 inches into the cellar to the first beam. This arch once supported the hearth which was above on the first floor. At the north end of the cellar, one projecting support stone remains in the cellar wall, enough to indicate there once was a similar arch there. The other support stones apparently were broken or removed from the north cellar wall to make room for a modern heating unit. An added outside entrance into to the cellar, located beside the south arch, is trimmed with larger bricks from a later date. That there was an earlier rear wing before the present kitchen wing is suggested by the foundation. The outline of the former tapering chimney (above the former first floor jambless fireplace and the existing cellar arch) is visible on the south gable wall of the attic. A rebuilt chimney (made of thin old bricks) rises to the ridge. The original gable end roof framing, showing the steep slope of the former roof, is visible in this south end of the attic. Along the top of the former gable end wall are vlechtingen (inverted brick triangles) in the Dutch style. They once were part of a standing gable which projected above the roof. The inside of the visible original south gable wall is laid in the thin, early bricks, (now covered on the outside), which remain within the old framing. Above the old wall, 20th century brick laid to fill space under the new roofline can be seen in the gable. A fire in the north gable, which gable has been rebuilt, has removed early attic evidence at that end. The impression is that this two-room house when built was constructed with early small bricks and had jambless fireplaces at each end. The bricks suggest the house very likely dates to c.1700, give or take a few years. If so, this Van Deusen-Hurley house is a remarkable previously unrecognized survivor of the late seventeenth century or very early eighteenth century. The existing house with large lot is in good shape is for sale, the asking price $229,900. Those interested in purchasing the home should contact Carla Bakerian of Heartland Properties at (518) 479-5434. Photos courtesy Shirley Dunn: Above, the Hurley-Van Deusen house in the 1950s (note the beam anchors in the gable)- Middle, the hearth support, a brick arch under the original first floor hearth of a jambless fireplace, remains in the south end of the cellar. Note the small size of the early bricks, which are similar to those used throughout the house. Below, the old, small bricks of the Hurley-Van Deusen House at present are covered with siding to protect them. Note the beam anchors, now used for decoration.